Soldier Speaks Up A Decade After Pat Tillman's Friendly-Fire Death : The Two-Way Steven Elliott, one of the Rangers who mistakenly fired on Tillman's position, says he believed there were no "friendlies" in the area when he pulled the trigger. Pat Tillman, in a 2003 photo provided by Photography Plus. Tillman was killed in a friendly-fire incident in Afghanistan on April 22, 2004. 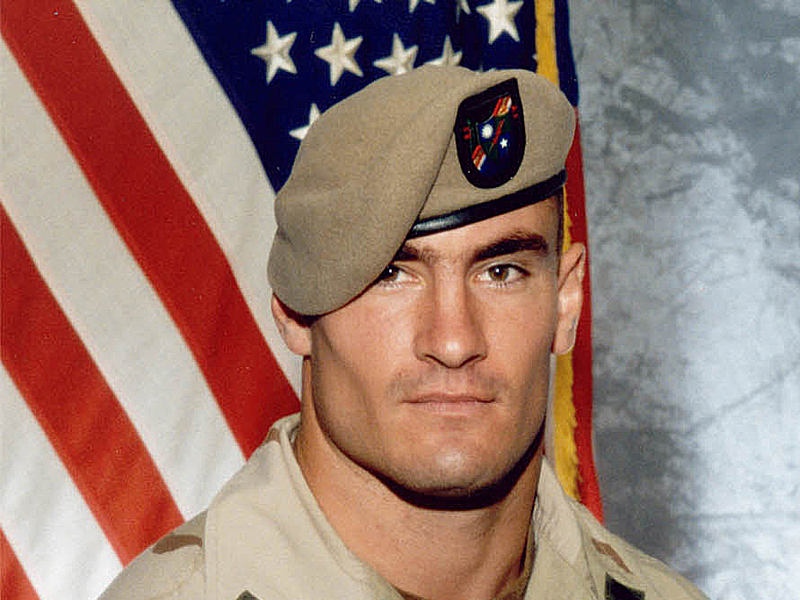 Ten years after the friendly-fire incident in Afghanistan that killed U.S. Army Ranger and former NFL star Pat Tillman, one of the soldiers who mistakenly pulled the trigger says he's still haunted by demons from the night of April 22, 2004. Steven Elliott tells NPR's All Things Considered that on the night of the incident, he could see only "shadowy figures" and had every reason to believe that when his squad leader, Sgt. Greg Baker, opened fire on what turned out to be Tillman's position, there were no "friendlies" in the area. "We'd all been firing our weapons at various positions, up to that point, effectively enemy positions," Elliot tells host Melissa Block. "The sun had been set for roughly 20 minutes, so the lighting conditions were poor to say the least." "The events leading up to one of the most infamous friendly-fire deaths in U.S. military history were rife for second-guessing from the start: After an Army Humvee broke down in the mountains, Tillman's platoon was ordered divided by superiors so that the Humvee could be removed; a local truck driver was hired as the hauler. But the two groups struggled to communicate with each other as they traversed the steep terrain. And the second group soon became caught in a deafening ambush, receiving fire as it maneuvered down a narrow, rocky canyon trail. "Tillman's group, which had traveled ahead, scaled a ridgeline to provide assistance to fellow Rangers under attack. But a squad leader, Sgt. Greg Baker, in Elliott's armored vehicle misidentified an allied Afghan soldier positioned next to Tillman as the enemy and opened fire, killing the Afghan and prompting Elliott and two other Rangers to fire upon what Elliott called shadowy images, later learned to have been Tillman and then-19-year-old Bryan O'Neal." Forensic experts have determined that rounds from Elliott's weapon were probably not the ones that killed Tillman. But that doesn't change anything, he tells NPR. He says that on the evening of the incident, he saw his squad leader engage Tillman's position and followed suit. "I remember thinking for just a second or two, but what felt like longer — your perception of time in the midst of a firefight can be distorted — that if he'd fired, and without any other information to indicate a friendly position, that I should also fire," he says. Tillman's family was initially told that their son was killed by enemy fire. It was not until more than a month later that they learned the actual details of his death. Among those who were kept in the dark were Spc. Tillman's own brother, Kevin, a fellow Ranger in Elliott's platoon. Elliott says he and others were instructed by their unit leaders "not to discuss [the incident] with folks outside the unit, and that was mainly because it was still under investigation. "I was operating on a certain level of naiveté, I believe," he says. "[I thought] senior leaders were trying to protect the family, and I had no idea they were being deceived at any point." Elliott says he felt "very conflicted" about not talking to Kevin Tillman about the tragedy. "I always felt like I didn't know what to say to Kevin," Elliott says. "It felt like something that you just wanted to avoid, and it grieves me to no end that I didn't make the effort at that time." To this day, Elliott, who has struggled with alcoholism, PTSD and divorce, all of which he traces to the friendly-fire episode, says he has never communicated directly with the Tillman family. "I always felt very conflicted about that," he tells NPR. "I knew that they were very, just hurt beyond belief ... [both in] losing Pat but then in the grief and the confusion of the deception." He says he hopes one day to talk to them. In the meantime, he and his wife reconciled and remarried in 2010. And he's talked with others who have been in friendly-fire incidents, mostly soldiers who served in Vietnam. "In some of those conversations, I felt like I was looking in a mirror," he says, choking up. "I saw the 1,000-yard stare in their eyes, and just the unresolved emptiness and hurt that that brings."